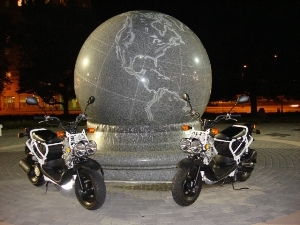 Looking for a Honda Ruckus review? Well, here’s mine.. Anyway, it was perfect timing ’cause now there are currently only three -2008’s left in Canada I am told by a friend looking for one. Now it’s July ’08. BONUS: I actually got a 2007 model on sale! It was in the showroom brand new and they were selling off last year’s model. Sweet deal. They had two left – one black and one white camo. Seeing as my 2 riding pals each had black ones, I decided to go with the white camo.